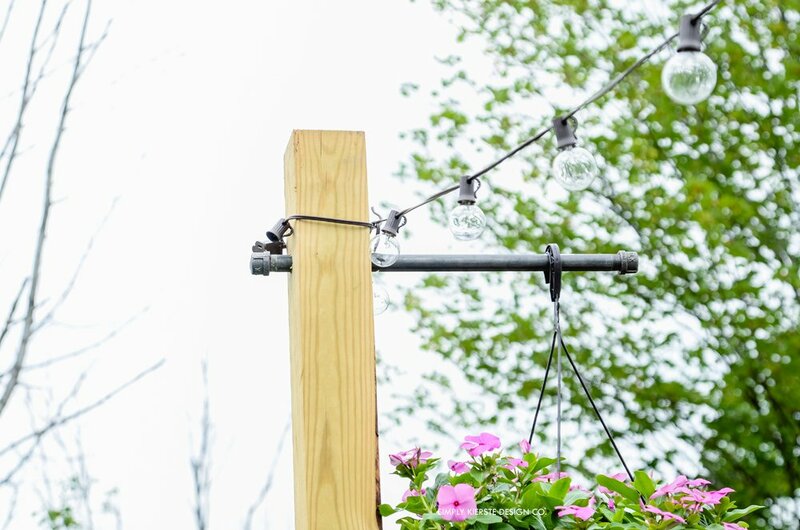 One of my very, very favorite things about our Backyard Patio Makeover is the Outdoor String Lights on DIY Posts. 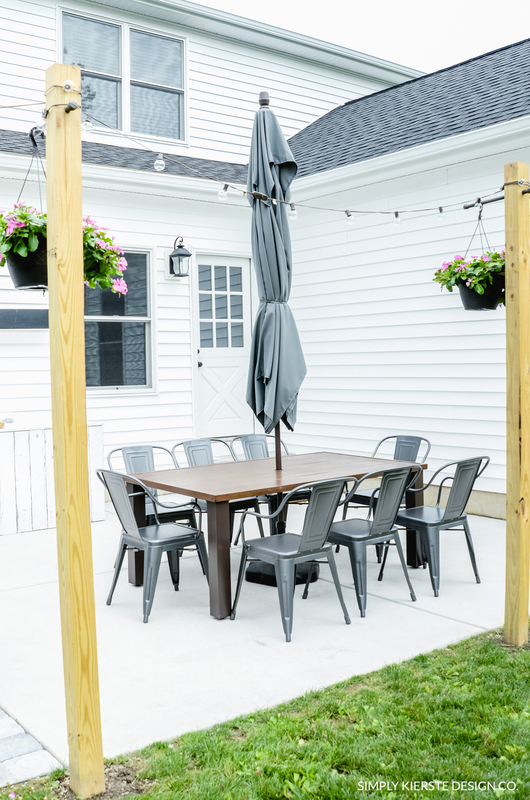 They not only bring the whole space together, but give us much needed light in our very dark backyard! 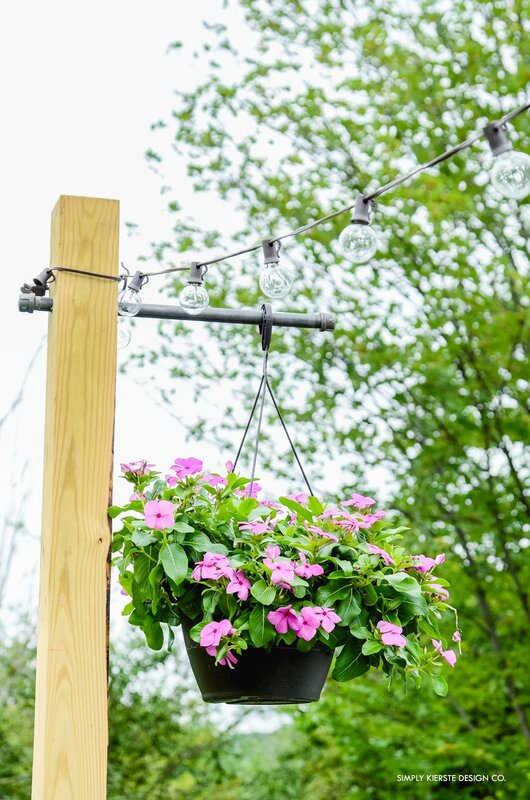 I knew from the time we started working on our patio that I wanted outdoor string lights, but with no trees to hang them from, we had to come up with a different plan. I didn’t want to use planters, so instead we put posts directly in the ground where we wanted them, then strung the lights. I absolutely LOVE it. 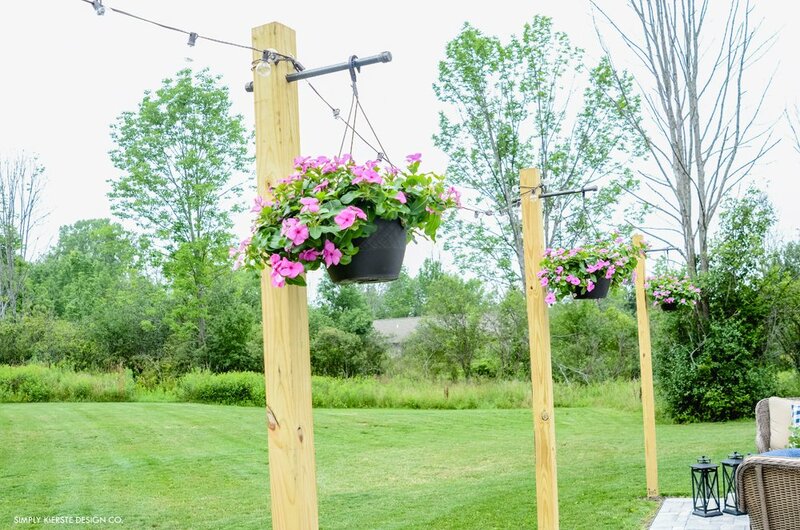 We hung flowers from the posts, and they gave it the perfect touch. 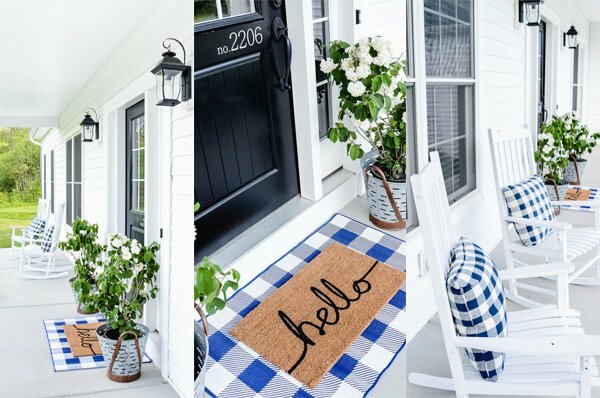 Best of all, it’s an easy weekend project! They are so lovely during both the day and at night. When I look out my windows, I see the bright colored flowers and lights going across the patio, and I love sitting out there. 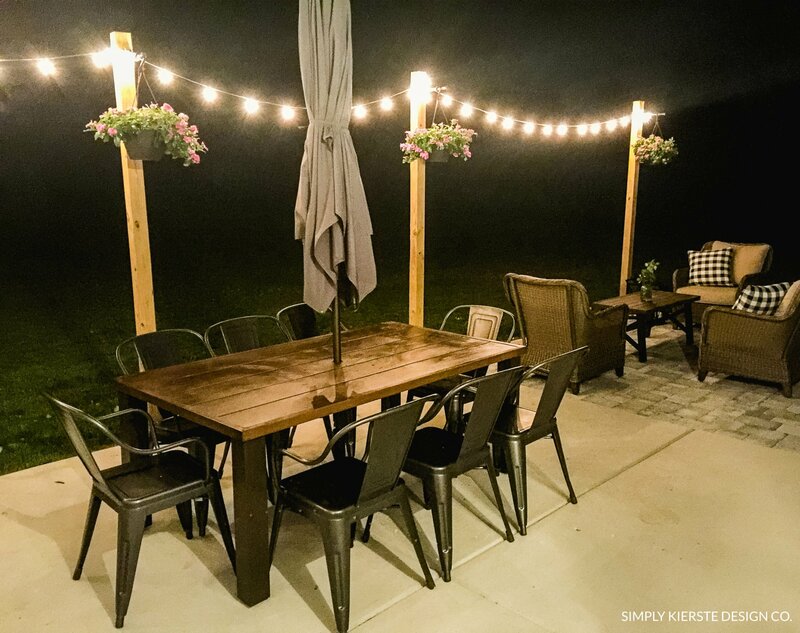 At night they light up our whole patio and gives it a glowing, cozy atmosphere for hanging our family and friends. They’re also perfect for entertaining! 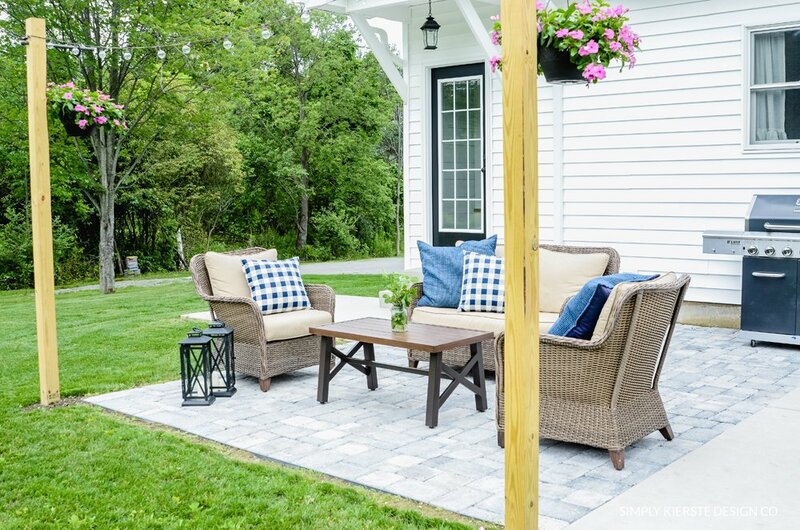 This one project completely changes the look of the space–what a different it makes! Affiliate links are included below for your convenience. When you click on a link and purchase something, it helps support this blog, at no extra cost to you. Here’s everything you need to make your own! Decide where you want your posts, and how many you need. Make sure you buy pressure-treated lumber! 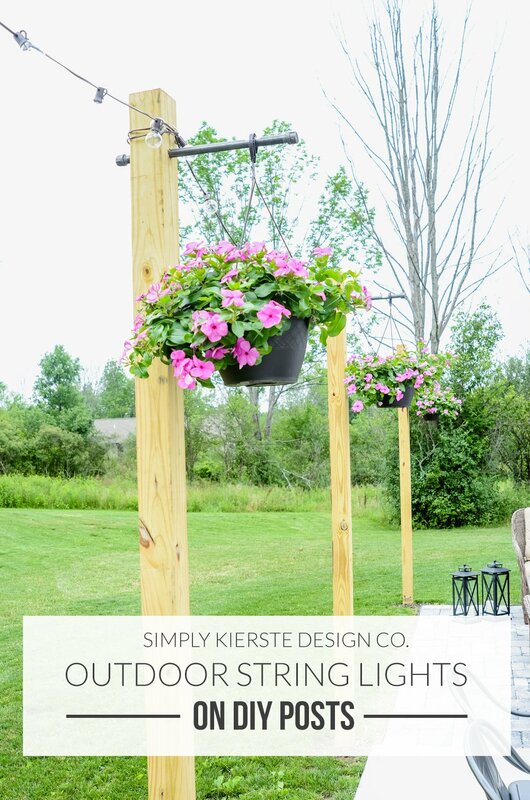 (If you want to paint or stain the wood you can, but you have to wait until the posts are completely dry–a month or so. You can still see some of the writing on my posts in these pictures!) Depending on how far down your posts need to go, you may want to get a longer post. I suggest having them be about 8 feet above ground. See #2 for info on how far down your post needs to go. Dig the holes for your posts. How far do you go down? That will vary by location. Check the frost level in your area, and you’ll want to dig down that far. (Here’s a map you can look at, or ask your local hardware store.) If you don’t have to go too far–18 inches to 2 feet–you could use a shovel. Any farther down than that, and you may want to consider renting a post hole digger (auger) from your local hardware store or tool supply company. Even though we live in rural area, we’re lucky to have a tool supply company very close. We have a trailer so we can pick rented tools up, but check with the store about delivery, which they will often supply. If you’re going down 4 feet, it’s a very big 2-man auger, and you’ll need two people that can handle. I was able to do it with my husband, but I definitely got my workout in for the day! Mix and pour cement. We used 4o pounds per post. The concrete dries super fast, so you can just hold the post level for a few minutes, and it will be dry enough to walk away. You will have a few more minutes to make adjustments if you need to (won’t be completely solid for a couple hours). 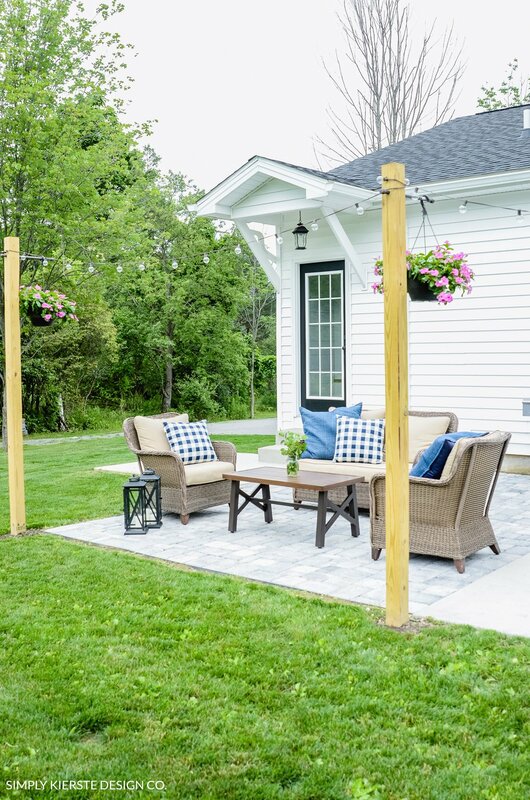 A post and pipe level is extremely helpful to ensure that your post is totally straight–makes it so much easier, and I highly recommend it! 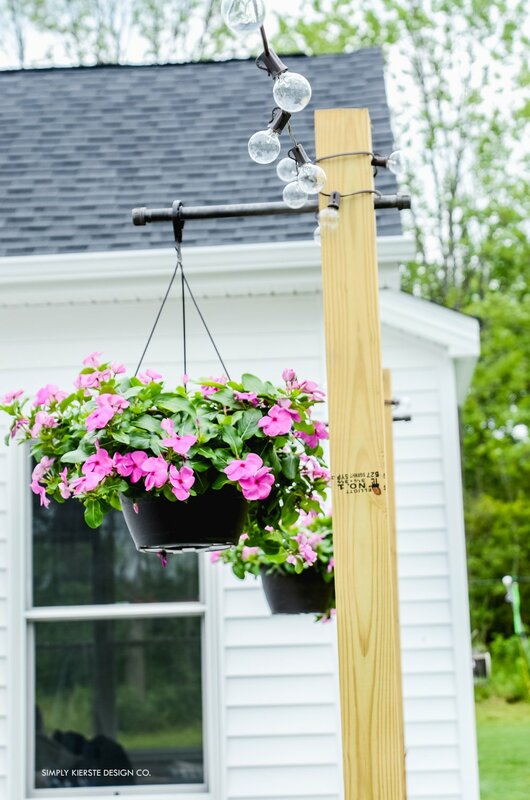 Add the pipe to your post by using your drill and 7/8 in. spade bit to drill a hole where you want the pipe to be–we did ours 6 inches from the top. Screw on the caps. Hang your lights! We started on the end that didn’t have the outlet nearby, making our way toward it. I had a couple of strands in order to make it long enough, but it was a little too long, so we wrapped the lights around the top of the posts a couple of times to make them fit. We also used hooks to keep the lights on. And you’re set! 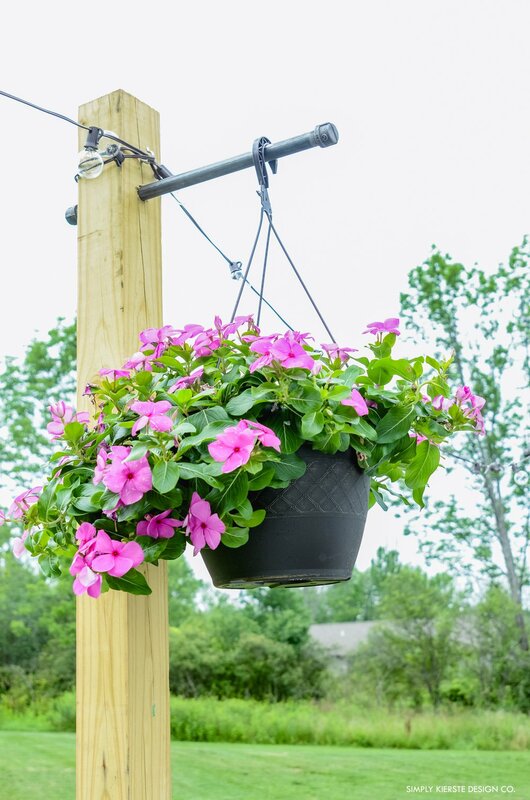 You’ve got a beautiful addition to your patio or outdoor space.